The day of surgery arrived at last, I just wanted to get it over and done with as quickly as possible. I was taken from the Ward at 11:45 which was roughly the same time as my last operation here. As is becoming more the norm they had trouble finding a vein to get the cannula in to. When I’m cold my veins seem to shy away from the surface so the Anaesthetist used a neat little trick. He filled up a surgical glove with hot water and got me to hold it in my hand, eventually he managed to get a vein to appear just enough to get the cannula in to put me to sleep. While I was in Theatre the Anaesthetist put in another cannula, which was much bigger in size. They like to use these bigger sizes in Theatre as they can get more fluid into you quicker should they need too. Unfortunately the position he used meant the tube was sitting right on the knuckle of the left wrist, which was extremely painful. To my relief they actually remembered to catheterise me while I was asleep too, which meant no accidents or issues like I’ve had before. I was taken from the Theatre to Recovery at 14:20 and I awoke to find my leg in a Cricket Splint and an inflatable trough. 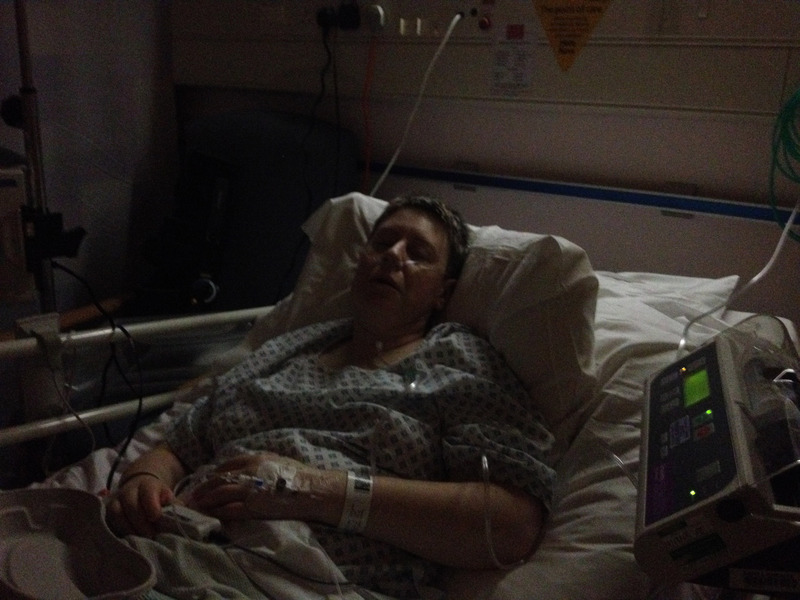 The Anaesthetist said he would put in nerve blocks as before, which he had and they seemed to be working well. Before the surgery I asked him how it was possible that they had done blocks last time but I could feel the drain, which was really painful. He asked me if the drain was down the right side of the knee, which it was. Apparently there are three areas they can block and that part is one they tend not to do. The other problem with blocks is they are unpredictable, some work and others don’t and the time they are effective for can vary too. I landed back on the Ward at 16:30 and not too long after that the Registrar came to see me. He told me it was interesting as most of the infection seemed to be superficial and not in the joint this time. Deep tissue samples were taken again to see what they could grow, if anything. Late that night the foot ballooned up to a size it had never been before. They tilted the bed so my foot was elevated to try and get the swelling to come down. All I had to do then was hope for a settled night.